MAKAHA surfer Richard "Buffalo" Keaulana was amazed when he heard drums beating a welcome and saw the pulsing movement of thousands of people along the shore as he rode on the Hawaii voyaging canoe Hokule'a into Papeete, Tahiti. "I never thought there would be that many people. The whole coast was covered with brown-skin people with no shirts, hitting the drums and chanting," recalled Keaulana, 71. Thirty years after the historic 2,400-mile journey south, the reverberations of the first voyage are still being felt, contributing to a renaissance in canoe-building and pride in Pacific island cultures. The success of the Hokule'a supported the assertion that by using way-finding methods, Pacific islanders could sail thousands of miles to distant shores centuries before Westerners had developed the chronometer and other modern instruments that enabled them to make accurate long-distance voyages. The arrival of the Hokule'a crew in Tahiti paid homage to the intelligence and courage of their ancient seafaring ancestors and let loose a wellspring of cultural pride and creativity. Before the crew touched the shores of Papeete, more than 60 songs had been written about the historic trip, in a contest promoted by a Tahitian radio station. More songs and dances as well as sculptures and paintings about the Hokule'a have followed, inspiring creativity in the native arts of Pacific islanders. During a decade of turmoil and change in the 1970s, the Hokule'a emerged to become a symbol of a renewed Hawaiian culture. Crew member Nainoa Thompson, who eventually became the first native Hawaiian navigator in modern history to sail to Tahiti from Hawaii, recalled that prior to the 1970s, teaching Hawaiian culture was not a priority in the educational system, and as a child, his grandmother was beaten by a teacher for speaking the Hawaiian language. But he said in the 1970s there was a turnaround. Native Hawaiians developed native language immersion schools and ethnic studies programs at the University of Hawaii. A group of Hawaiians who were promoting native values about caring for the land were arrested for trespassing while trying to stop the military bombing on the island of Kahoolawe. "Ultimately, Kahoolawe island changed from enormous abuse to enormous healing," Thompson said. The voyaging canoe helped heal the wounds of the dethroned native culture. "Hokule'a was arguably a driver of change," Thompson said. "There is nothing more debilitating and crushing to any child than to have them grow up thinking they're second-rate. If you ask me what's the greatest contribution of Hokule'a, it's restoring pride." Thompson said in the process of rediscovering their ancestry, crew members have sailed 110,000 nautical miles in the Pacific -- equivalent to circumnavigating the world more than four times. In sailing over the largest ocean in the world, they have come to realize the immense achievement of early Polynesian migration. "We've explored a nation on Earth bigger than Russia," he said. "Arguably in their time, our ancestors were the greatest explorers on Earth." To the untrained eye, the Pacific Ocean can seem an endless monotonous expanse dotted with tiny islands and atolls, but to Pacific islanders with a voyaging tradition, the ocean was a moving seascape with different winds, currents and tides that could aid them in their journey. The sun, moon, stars and the birds also helped as guides. 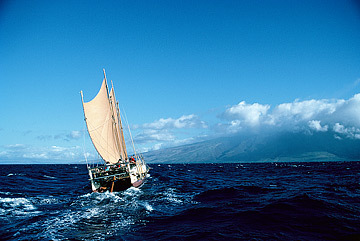 At night during spring, the Hokule'a used the Southern Cross to tack toward Tahiti. When dawn came and there were no stars visible, the sun rising from the east served as a directional finder to maintain a course. At noon, when the sun was too high to determine east or west, the bow was kept at the same angle against the waves as had been noted earlier in the day. The Southern Cross rose higher in the sky as the crew traveled toward Tahiti, and land-based birds who fished at first light guided them to the island. Thompson said that while the achievements of Polynesians were not taught in the 1960s, they are being taught to this generation of students. As a result of their travels, native Hawaiians have found they can speak to and understand Polynesians living thousands of miles apart from Rapa Nui (Easter Island) off the coast of Chile to Aotearoa (New Zealand). "Hokule'a reunited a memory of an ancestral family," he said. The vessel has not only taken Hawaiians on a voyage confirming their ancestral roots, but also carried the medium for awakening cultural pride and interest among other Pacific islanders. In the Voyage of Rediscovery from 1985 to 1987, the Hokule'a retraced migration routes with stops in Tahiti, the Cook Islands, Tuamotus, Aotearoa, Tonga and Samoa and raised interest in constructing double-hulled voyaging vessels. What began as one voyaging canoe has multiplied into more than 11, including several built in Hawaii. The Polynesian Voyaging Society also taught way-finding navigation to indigenous peoples from other Pacific islands. The trip gave some crew members the resolve to reach out and do something greater with their lives. Inspired by the voyage and society founder Tommy Holmes, Keaulana helped begin an annual canoe-surfing competition at Makaha beach. Chad Baybayan, who sailed on a later crew and also became a navigator, said his Hokule'a experience gave him the discipline he needed to obtain a master's degree in education. He is now in charge of a division of a Hawaiian language immersion program in Hilo. "The experience with Hokule'a is the kind of education you cannot get at a university -- real-life education," he said. "You find ways of studying and reading to make you better." Thompson said the society is now teaching traditional way-finding to high school students, the next generation of ocean navigators. "They're younger than the voyaging canoe," he said. He said that when teaching he keeps in mind his own experiences as a student, and feels blessed to have known leaders of the Hokule'a -- society founders Herb Kane, Ben Finney and the late Tommy Holmes, navigator Mau Piailug of Satawal, Micronesia, and his own late father, Myron, who served as a president of the Polynesian Voyaging Society. "The most valuable thing to me is not finding the island. It was the journey of being among these extraordinary pioneers, people who went against the grain of society, took risks and took chances," Thompson said. "It was the mind of science and spirit of culture coming together with a beautiful vision of the canoe."